Clear skies. Low 51F. Winds SSW at 5 to 10 mph.. The Lodi Public Library will be abuzz about bees on March 16, when Jerry and Ellen Johnson bring Uncle Jer’s Traveling Bee Show to town. The show will include a 12-minute puppet show, a PowerPoint presentation about honeybees — and two observation hives with live bee colonies. 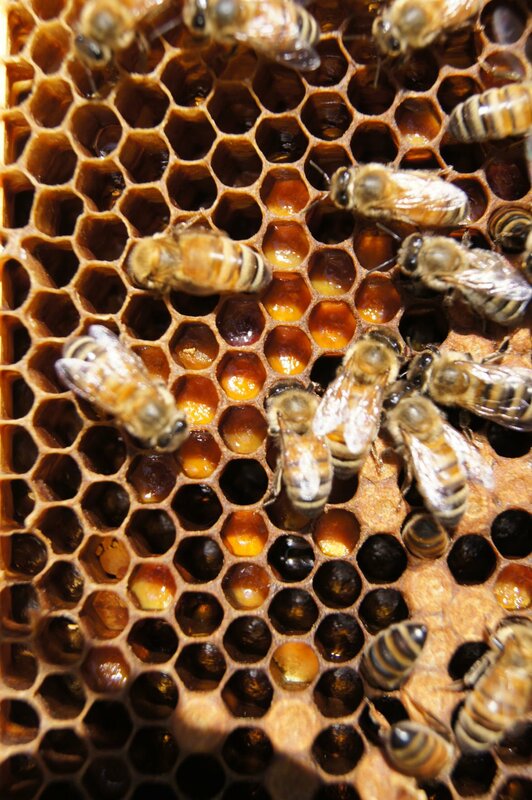 “In the observation hive, both have a queen marked with a white dot, and kids and adults have fun finding the queen,” Uncle Jer Johnson said. The Johnsons will also pass out honey samples at the event. The goal, Uncle Jer said, is to teach about the importance of bees, from the vital role they play in pollination to the health benefits of their honey. It’s knowledge he knows firsthand, after helping beekeepers and then working as a beekeeper himself for 60 years now. He admits he doesn’t know everything to know about bees — but it’s not for lack of trying. “You can always learn something new all the time,” he said. For example, honey is a natural antiseptic and can be used similarly to antibiotic ointment, he said. Most people who are allergic to ointments like Neosporin can use honey, he said. Just wash a cut with soap and water, then apply honey to keep it clean. “Every burn unit in every hospital uses a honey solution because it works,” he said. Groups such as the American Academy of Family Physicians and University of Maryland Medical Center suggest that honey can be used on mild, superficial cuts and burns much like bacitracin ointment. Of course, external use helps, but a teaspoon of honey for the patient to taste can help even more, Uncle Jer said. When one of his grandkids gets a cut, he’ll give them a little honey. “They’ve forgotten all about the owie because the honey tastes so good,” he said. For a bee sting, though, mud works better than honey, Uncle Jer said. And playing in the mud can help kids forget an injury as quickly as a spoonful of honey can. Scientists are always learning new ways bees can be useful, too, he added. Honeybees are being trained to sniff out drugs, and they may do a better job than dogs in some situations, according to a 2015 study. More recent research found that bumblebees could learn a rudimentary soccer-style game, as well as how to tug on a string to get a reward. Science is doing amazing things with bees, he said. Unfortunately, despite new scientific knowledge, colony collapse disorder is still a major problem, his wife Ellen Johnson said. Scientists are beginning to better understand the combination of causes, however. “It’s kind of the perfect storm of not enough food and exposure to chemicals,” she said. On the not-enough-food side, areas that once had many different crops are now focusing on one. In California, that’s almonds. In the Midwest, farmers are ripping up alfalfa and replacing it with corn and soy crops, she said. That means that bees only have a large food source for a very short time each year, then run out of food, she said. On the chemicals side, neonicotinoid pesticides wreak havoc on bee populations, she said. Even chemicals that are safe for bees in small amounts may combine with each other to form a toxic cocktail, she added. “When a chemical company says one chemical is OK for bees, they’re not mixing 10 to 12 together,” she said, but that’s what happens when they’re used. Bee populations are measured in April, so 2016’s figures aren’t available yet. However, between April 2014 and April 2015, beekeepers lost about 40 percent of their hives, Ellen Johnson said. Of course, part of the problem is that bee hives are falsely overpopulated to deal with large crops like almonds, she said. However, if there were more food sources — whether because farmers varied their crops or because more people planted bee and butterfly gardens — that would help, she said. It would take a lot to offset, but every bit helps, she said. “I think one of the best things you can do as a concerned citizen is plant a pollinator garden,” Ellen Johnson said. Educating children and adults alike on how they can help protect bees is important, Uncle Jer said. The Johnsons hope that they can share their interest in the honey-producing insects and their care to those who come to their show next week. “The key thing that we do is try to help the children to be safe and calm around honeybees,” Uncle Jer said. If humans stay calm and quiet around honeybees, the bees will mostly likely stay calm too, he said.